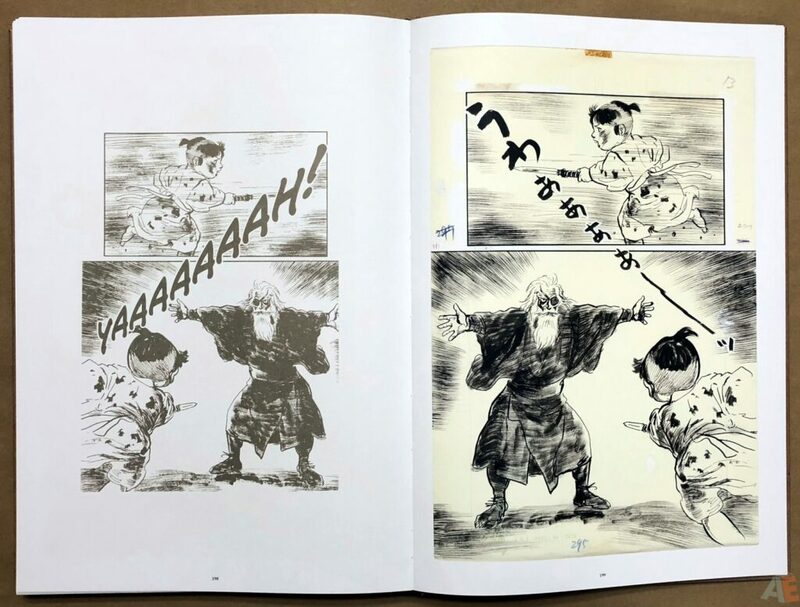 Kazuo Koike’s samurai epic is a tour-de-force of graphic fiction, and the Lone Wolf and Cub Gallery Edition features selections of the late Goseki Kojima’s spectacular illustration reproduced at original size on heavy-stock art paper to preserve the work in detail as it exists today, as close as one can come to owning these rarest of artworks. 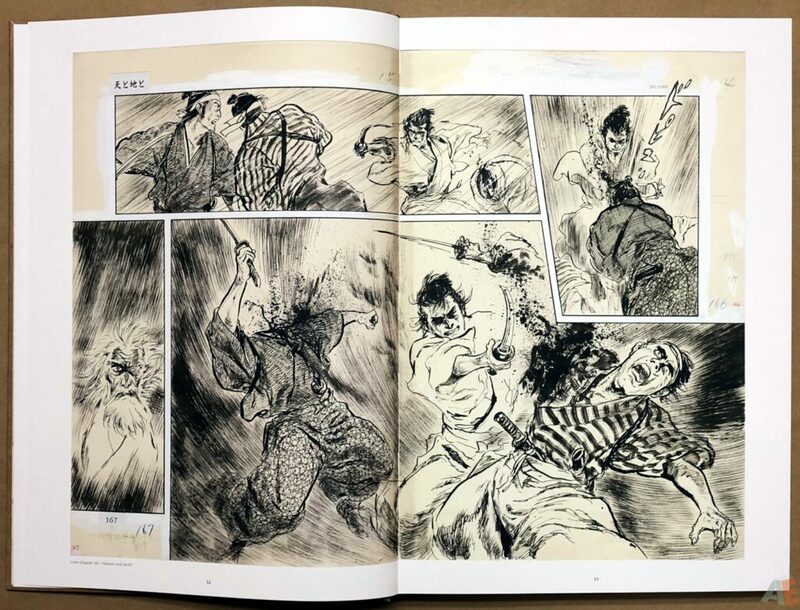 Including in its entirety the final titanic clash between Ogami Itto and Yagyu Retsudo. 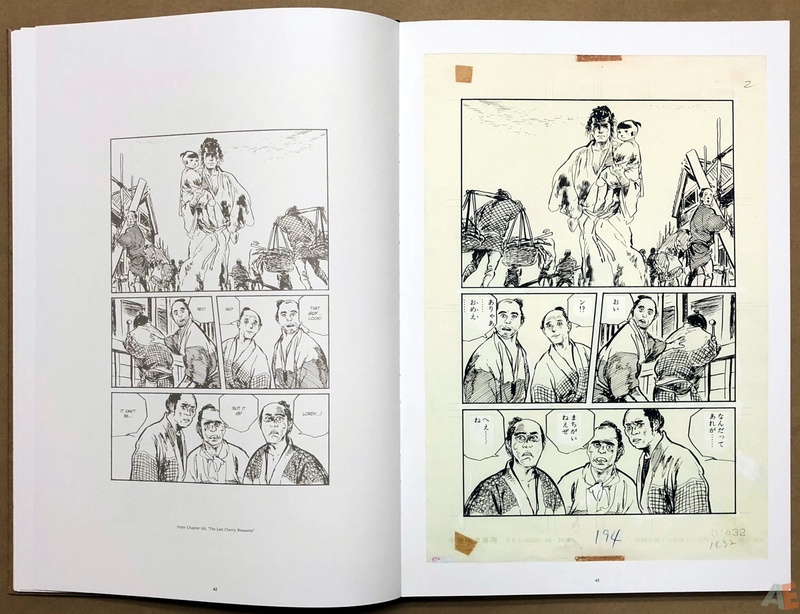 This deluxe volume is a must-have for collectors and enthusiasts of the finest comic art ever created. 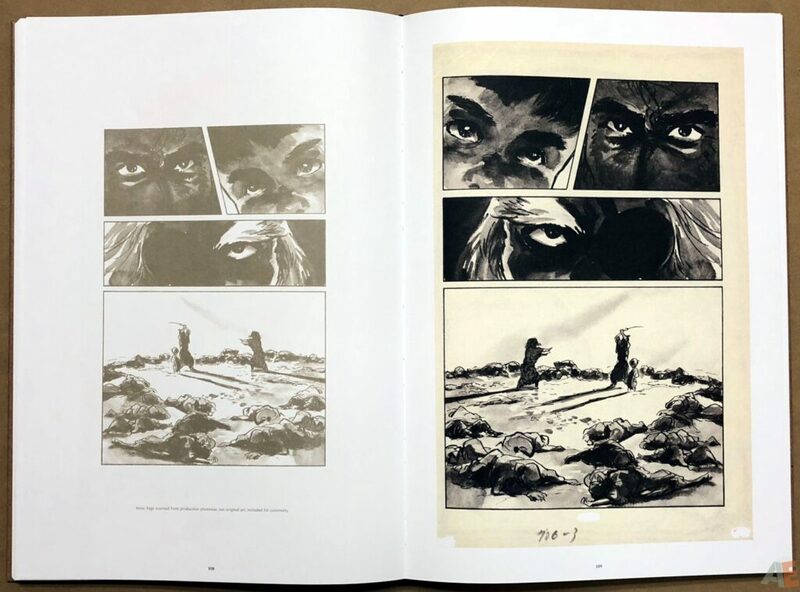 Reproduced from high-resolution scans at original size from the original art created over forty years ago! Accompanied by corresponding reproductions in English. 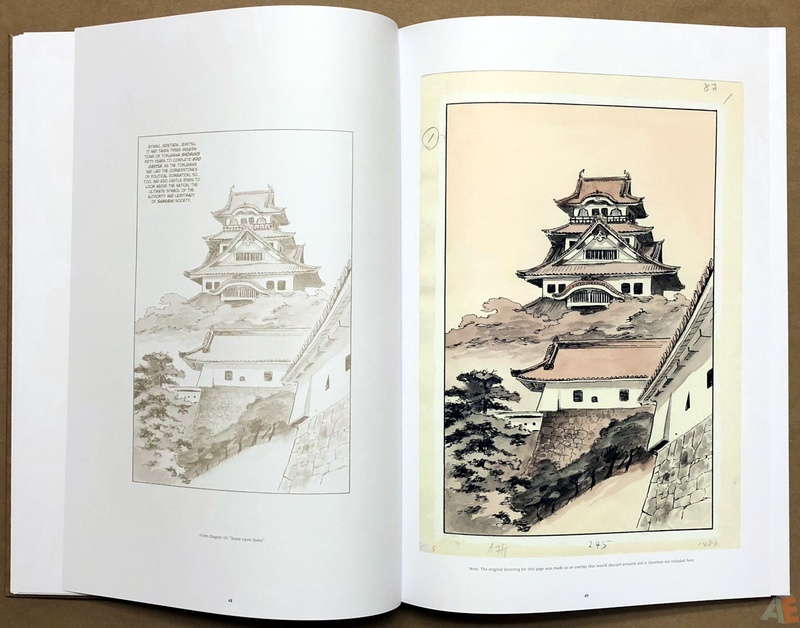 For the first time, a book of original foreign art at original size and offered with English translations to the North American market. 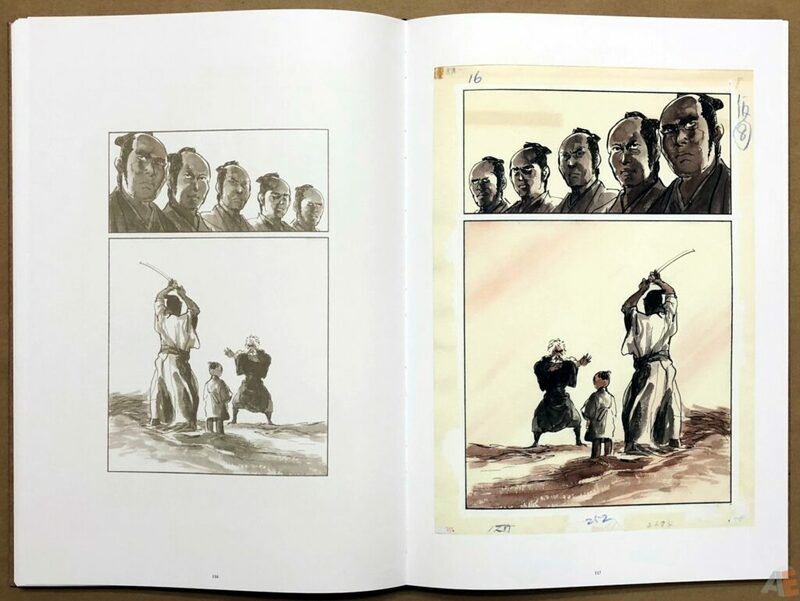 Lone Wolf and Cub is a seminal comic series and this is its ultimate presentation, unless material can be found for another Gallery Edition. The third AE format book to feature original art only on the right side; Star Wars: Dark Times Gallery Edition had unlettered art on the right and the script on the left, while Conan: Red Nails Original Art Archives had the art on the right and a panel enlargement on the left. Here we have the original art with Japanese lettering on the left and the same page in sepia translated and mirrored from the Dark Horse English versions. 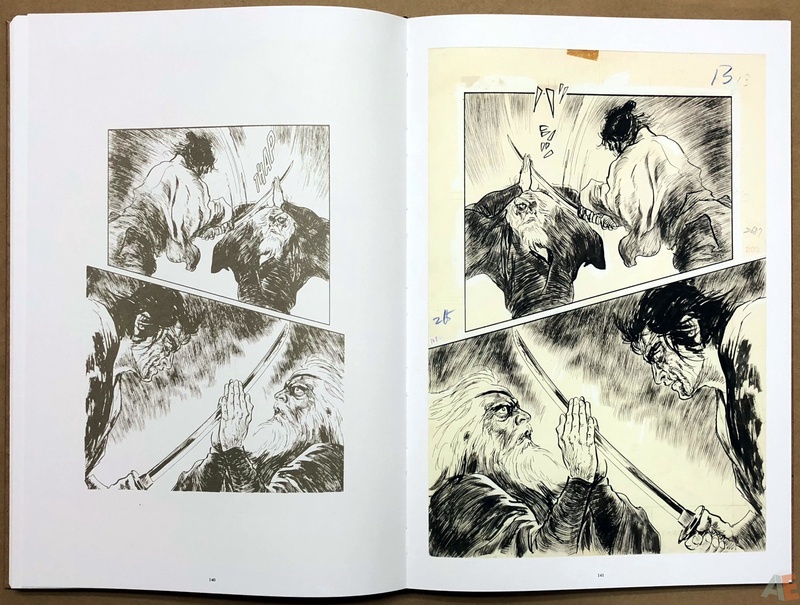 We get 44 single pages and 3 double pages of art from random chapters at the front of the book and then 53 single pages and 4 doubles pages from the final Lone Wolf and Cub chapter, Arms. 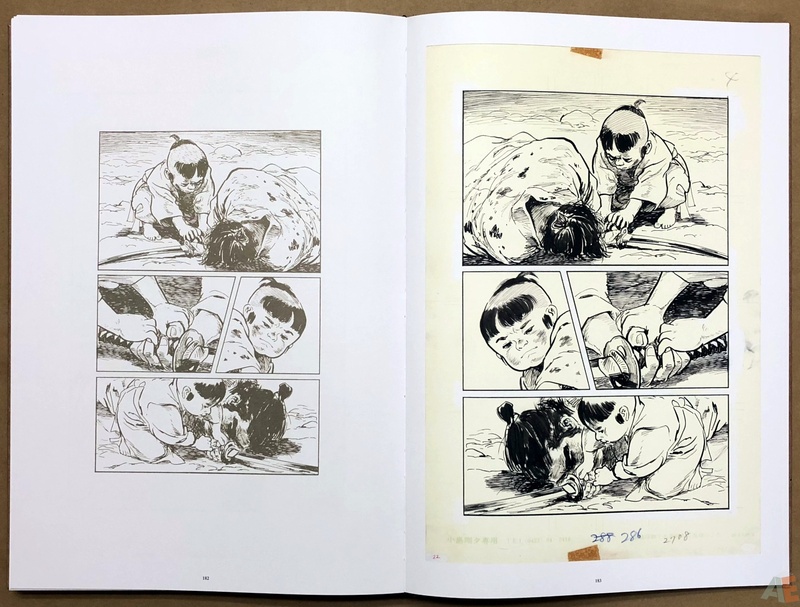 All but two pages are from the original art, with pages 109 and 163 having this note: Page Scanned from production photostat, not original art. Included for continuity. 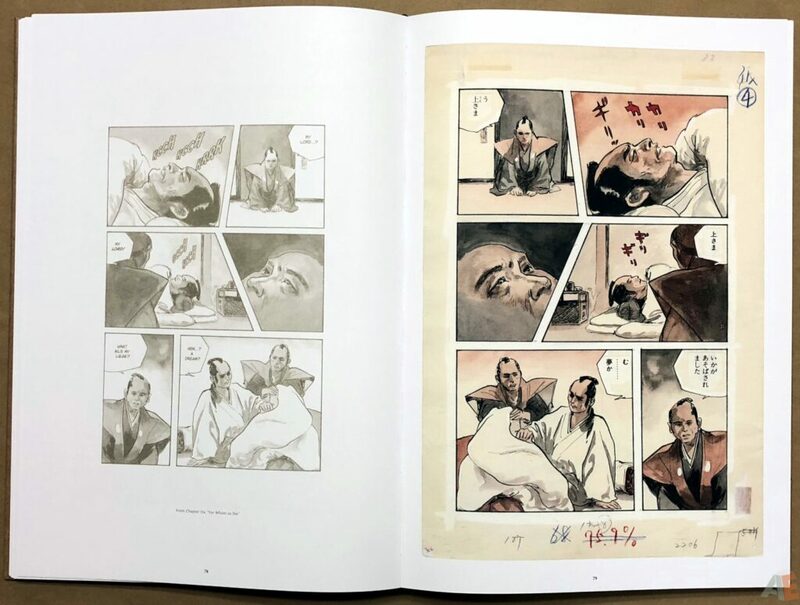 Or more accurately the sepia English version carries the note, as do all those leading up to the final chapter indicate what chapter it’s from. It’s sort of like getting a short Artifact Edition in front of a short Artist’s Edition. As Chris Warner notes in the introduction, most of the final chapter is wordless so it works for any language. 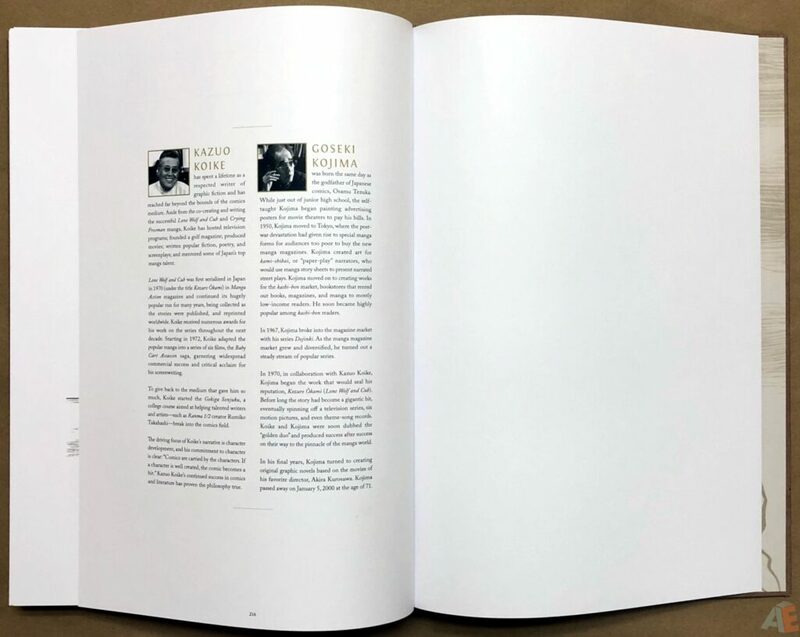 Page numbers are always appreciated, but there’s no table of contents to reference. 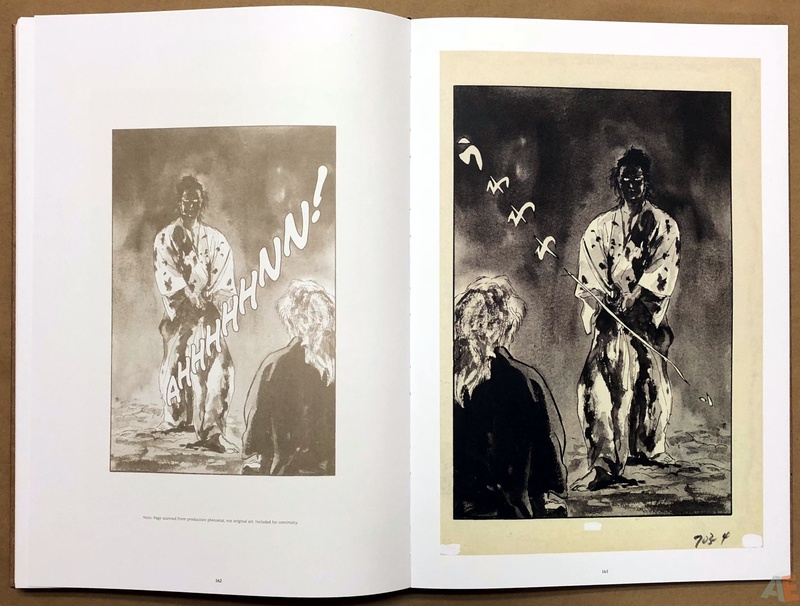 The book opens with an introduction by Warner, the art pages, and then closes with a one-page biography of Koike and Kojima. 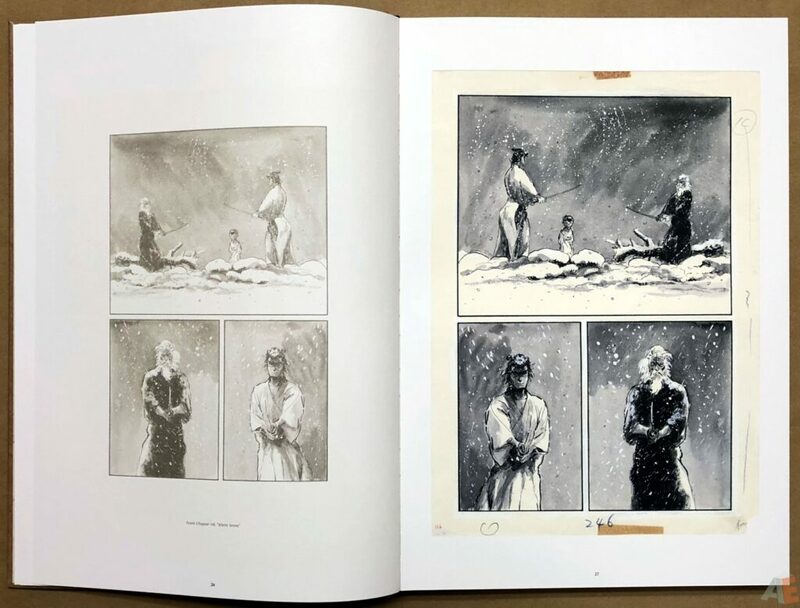 For those thinking they’re only getting 111 pages of original art, recognize Dark Horse has priced this volume as low as they can at $99.99 USD. Scans are all clear and clean; no visible issues. Blacks show gradients. 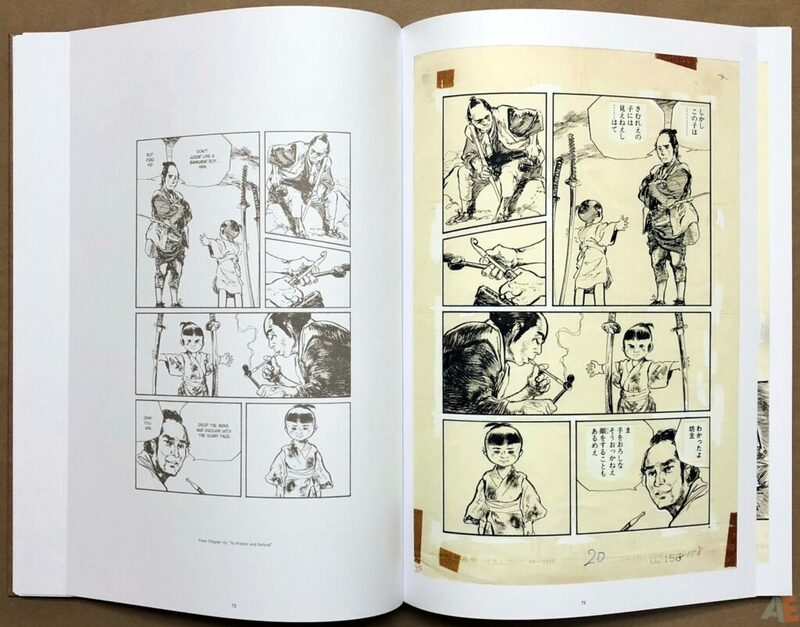 The dialogue was printed and then cut and pasted into the word balloons. The only margin notes are different page numbers. 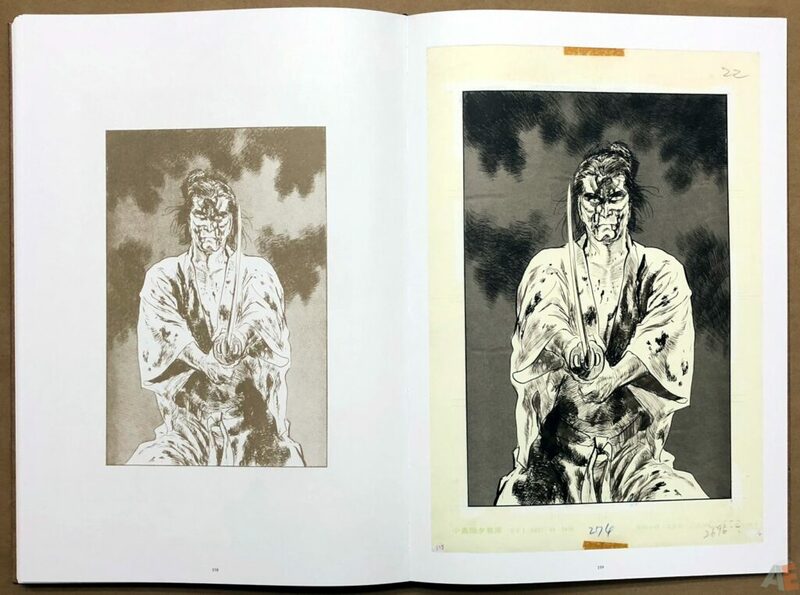 The pages are light yellow to yellow. Correction fluid almost exclusively to correct panel frames. Some Zip-A-Tone even. 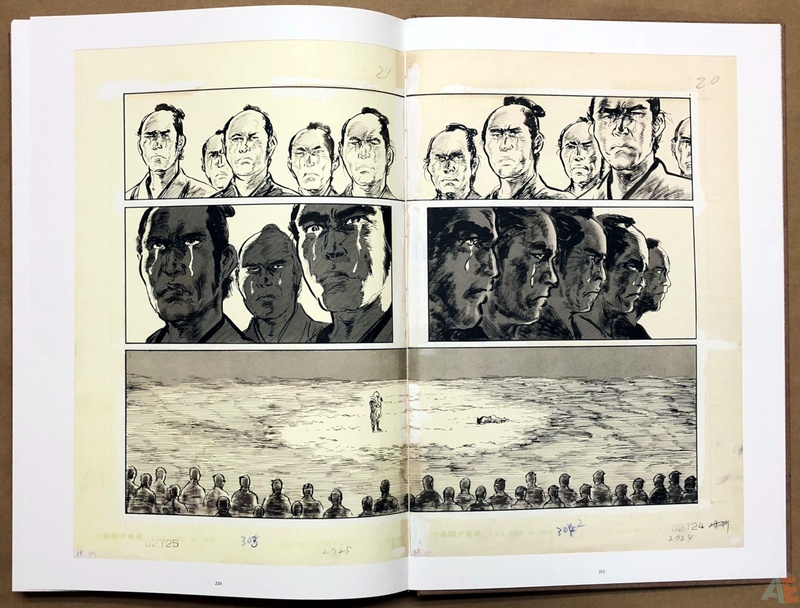 What the original art shows the most is the variety of mediums Kojima used, moving from pencil and ink to wash and watercolours. Simply stunning. 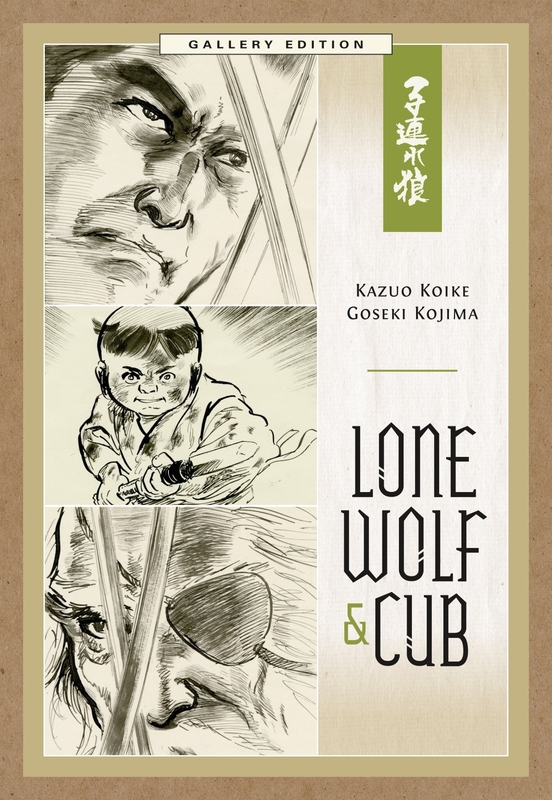 Oh, what wonders a watercoloured edition of Lone Wolf and Cub would be! 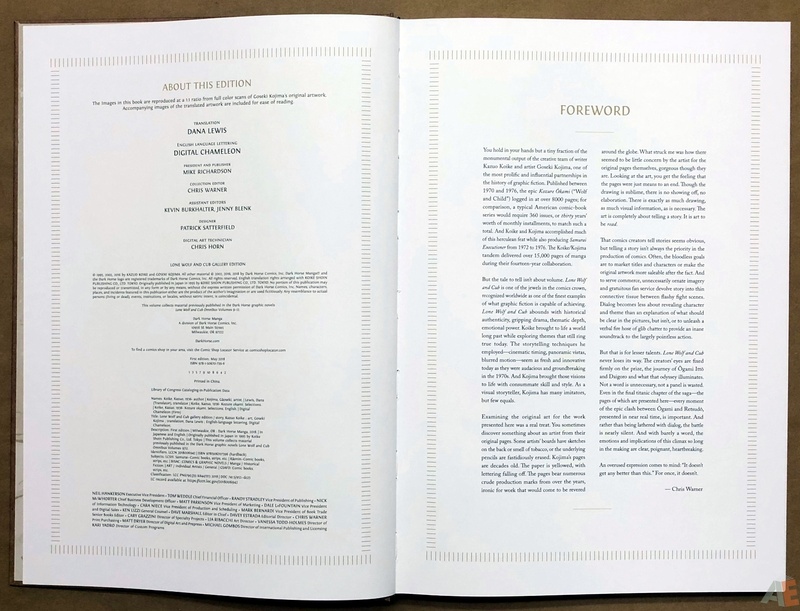 The design follows the now classic Dark Horse Gallery Edition format, with the brown paper cover and khaki outlines and text. 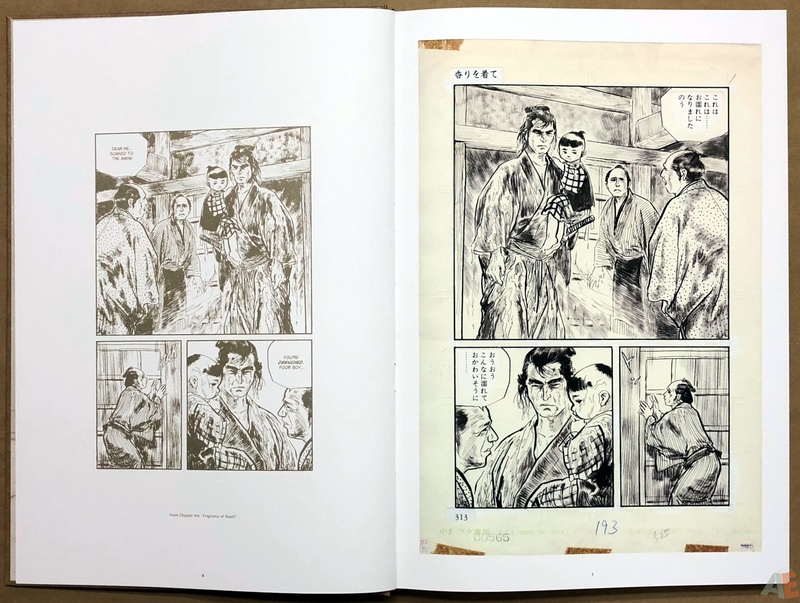 Tackling how to display the original pages with Japanese text must have been a challenge, and what is presented here seems to be the best solution to showcase the art and provide a means for people to read along. Heavy matte paper stock with a sewn binding. 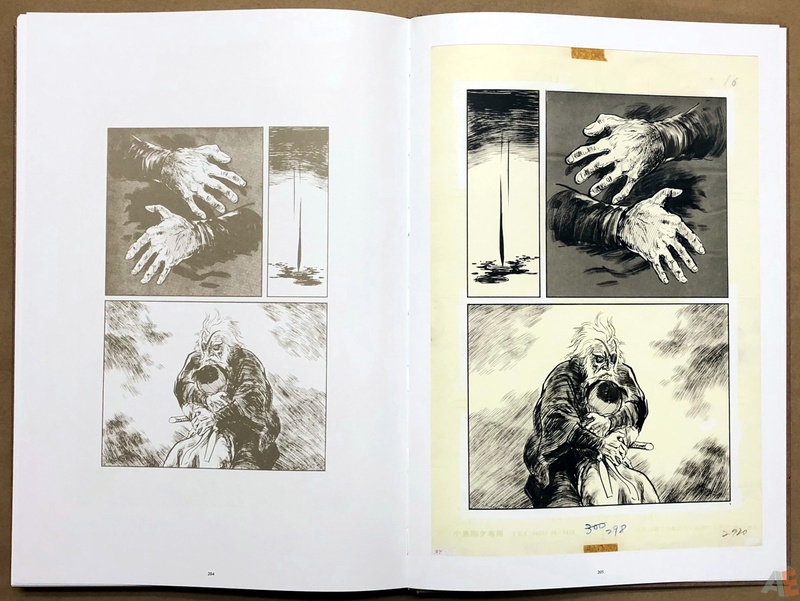 I found the book signatures were sewn but then glued where they met and because of this, a few of the double page spreads suffered from gutter loss. 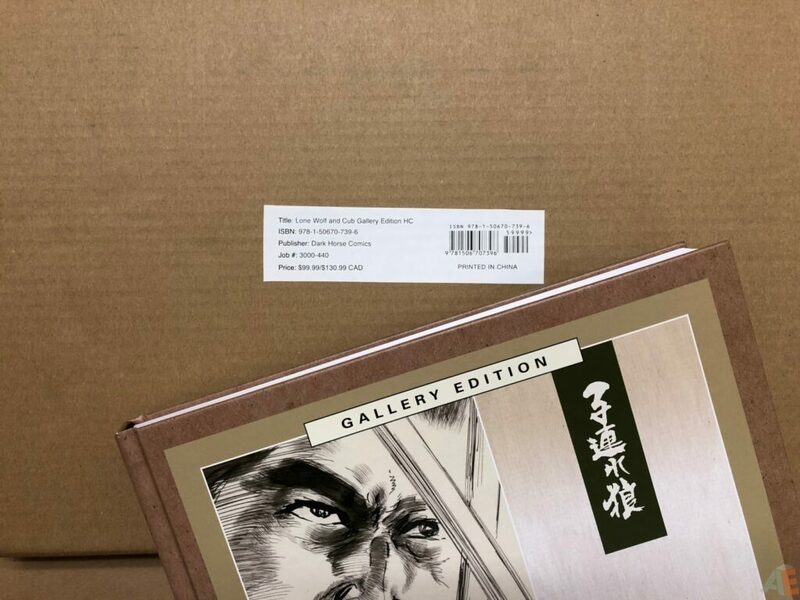 The book comes shrinkwrapped in a cardboard case with a text-only sticker displaying the title, ISBN and cost with UPC. On the back of the book is a small sticker with UPC and price; would have worked better on the shrinkwrap. I used the term seminal earlier on, and that’s the only way this work can be looked at. 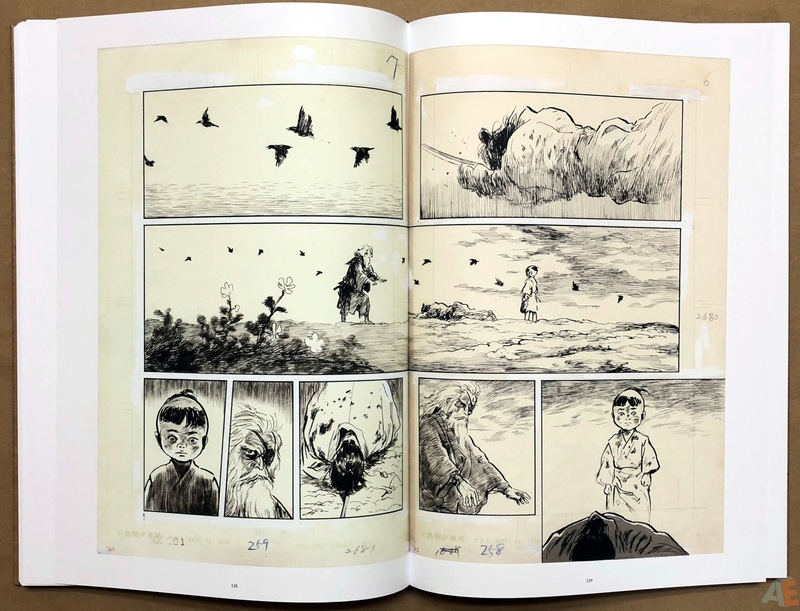 Is there any question countless comic creators have been influenced since its release? The art feels so different in its technique and style, yet complete and engaging. 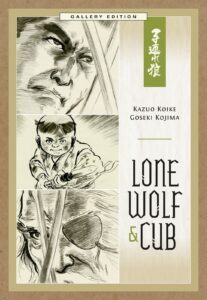 A true master knows what is and what isn’t needed on the page, and with this book, we get to experience Kojima in his mastery. My only criticism is wanting more. 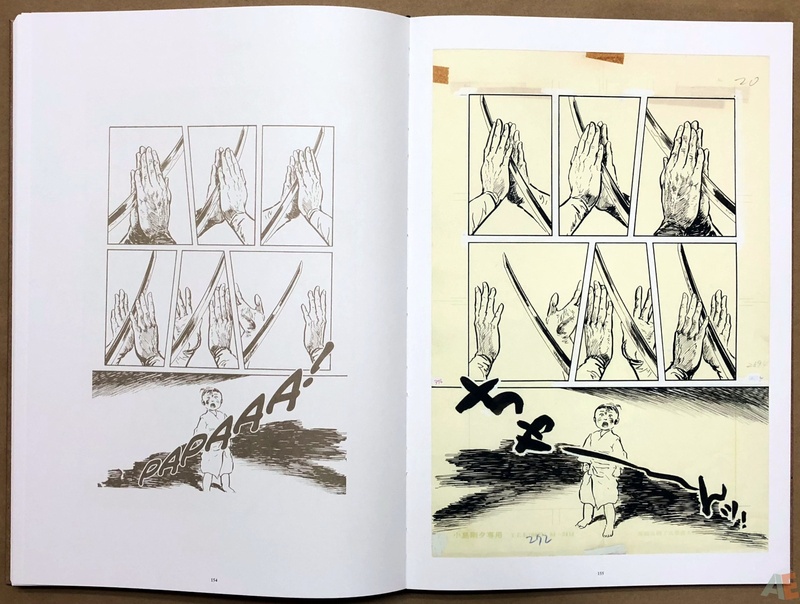 A short afterword providing some background into the original art, where it’s been, and how it came to be in this collection would have been the icing on the cake. And now this presentation, I can only hope, inspires others to publish foreign language material in the AE format.